Among content marketing pros, two legendary, historic examples of content marketing ideas get cited again and again as ultimate success stories: the Guinness World Records franchise and the Michelin Guide. The Guinness Book of Records was the result of brainstorming by Guinness Breweries exec Sir Hugh Beaver, who wanted to confirm that the golden plover was Europe’s fastest game bird after a 1951 hunting excursion. The annual compilation that resulted originally started as a promotional giveaway, but proved so popular that it became the best-selling book series of all time. As for the Michelin Guide, it was first published by the French tire company in 1900 because André Michelin and his brother Édouard wanted to encourage consumers to hit the road and explore (i.e., use their cars for fun excursions, wear out their tires, and then buy more tires). Over the years, the hotel and restaurant guide became so prestigious, and the Michelin star-rating system so trusted, that it created a highbrow halo around the brand. This is what every content marketer wants: to create content that’s so great, so incredibly valuable, that the content itself becomes a sought-after product—but at the same time fearlessly and blatantly puts the brand front-and-center. I call this shameless content marketing. 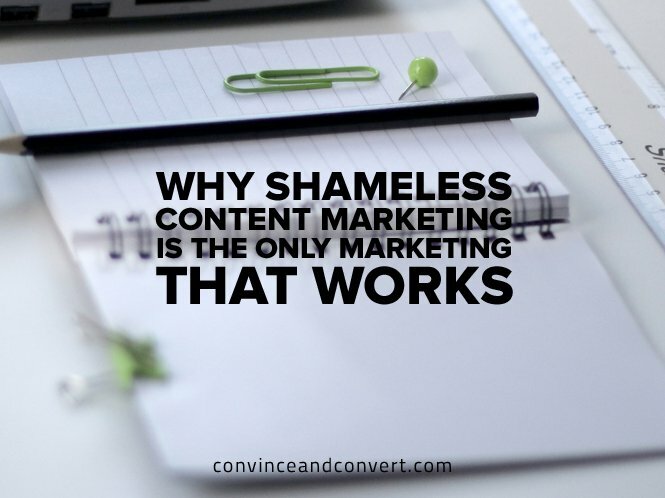 There’s no shame in selling overtly when you have great content. Some marketers have gotten too timid about putting their brands and products front-and-center in their content marketing campaigns. They’ve gotten so precious and pretentious about creating “pure” content that your average consumer might have no idea at all that a brand is behind the content. This is—what’s the right word?—stupid. Content marketing is marketing. It’s supposed to be self-promotional. The good news for content marketers is that we don’t have to go back 100 years, or even 50 years, for awesome inspiration. I have four more recent examples that I think will also stand the test of time. Coca-Cola’s global “Share a Coke” campaign—which puts common first names right on Coke cans, so you can, for example, “Share a Coke” with the name “Mary” on it with your friend Mary—first started in Australia in 2011. Over the course of that summer, the Coca-Cola Company sold more than 250 million bottles down under, where the population is around 23 million. It’s now gone global, with localized versions in more than 70 countries, where it’s now possible to “Share a Coke” with everyone from Françoise and Fritz to Juanita and Jiro. How ingenious to turn the actual product into a piece of content! Also wonderful is the idea of sharing something real—a frosty can of Coke—in an era of digital sharing. Known as a fearless connoisseur of global culinary culture, Anthony Bourdain spreads his wings even further in the Scottish distiller’s original web series about artisans who make things with their hands. He meets with Andrew Hoyem, master typographer and printer of San Francisco’s Arion Press, and legendary New Orleans saxophone player, designer, and restoration expert Steve Goodson. In one beautifully filmed episode, he even visits Dufftown, Scotland, home of the Balvenie. The distillery’s whiskey-making process is legitimately fascinating and fits in seamlessly with the overall point of view of the Raw Craft series. For much of the episode, the product is literally on display, and the Balvenie crew (including an on-staff coppersmith who has been tending to the distilling equipment for more than 50 years) get to talk about how and why they make a superior product. Plenty of brands will tell you that they are, yes, “hand-crafted,” but the Balvenie found a way to show you in engrossing detail while also shining a welcome light on other craftspeople around the world who share its brand values. Unlike lots of big brands that are mostly content with writing checks to sponsor athletes and sporting events that other media organizations then cover, Red Bull controls its own media channels. The energy drink brand’s Red Bull Media House division has built entire programming verticals around Motorsports, Adventure, Snow, and more at its website. They’ve also created thousands of hours of video that live at Redbull.tv, on its app, and on its YouTube channel (which has 5.4 million subscribers and nearly 1.5 billion video views). What’s impressive is that Red Bull splashes its name on almost everything, making it as much an extension of the brand as a media powerhouse as it is a content marketing operation for the soft drink brand. For the 2014 holiday season, British department store retailer John Lewis produced an adorable, two-minute short film, released online and as a TV commercial, about a boy and his pet penguin named Monty. Its heart-tugging conclusion sends a sweet message about the power of childhood imagination. Though the short film didn’t obviously sell anything, it was just one part of a stealthy marketing juggernaut that created an aura of interest around the Monty the Penguin character. John Lewis then leveraged that interest with Monty the Penguin stuffed animals, a Monty’s Christmas children’s book, and 37 other types of branded merchandise—all available exclusively at its department stores, of course. The content marketing campaign drove so much business to the retailer’s 2014–2015 bottom line that in June it was awarded the 2016 Creative Effectiveness Grand Prix at Cannes. All four of these examples tell a common story—one of marketers who truly get it, who understand that consumers’ time is precious and that the best way to get their attention and engage with them is to give them content that’s worth their while. When it’s done right, content marketing can be joyous, entertaining, informative, thrilling—and even touching. And when done shamelessly, it can make your brand not just the sponsor of great content, but the star of it. Ben is Chief Marketing Officer at GumGum with responsibility for brand management, integrated marketing programs and corporate communications. He oversees the planning, execution and distribution of consistent industry-leading content marketing campaigns. Ben helped significantly raise GumGum’s profile as a leading voice in the computer vision and digital marketing spaces. Ben is a guest columnist for top trade publications such as The Economist Marketing Unbound, MediaPost and CMO.com. He also regularly speaks at industry events such as AMA, OMMA, and Contently.